Serrill Thornton is my great, great grandfather. His third wife, Emily C., is also buried at the Grace Hill Cemetery, but some distance from Serrill. The monument for Delia and Fordie (who both died as infants) is near Serrill's, but Serrill was their grandfather. Their father was also named Serrill, but he is buried in Sioux Falls. Serrill Thornton is my great-great-great grandfather via a son from the first of three marriages. He was born in RI, grew up in VT and lived about 20 years in New York state before migrating with his second family to South Dakota and Iowa. The three children from his first marriage remained in the east, settling in Vermont and New York state. 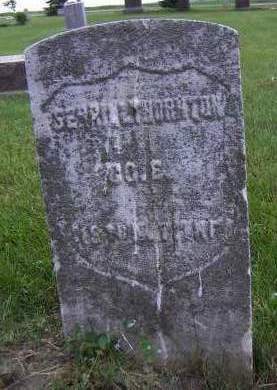 According to the Iowa WPA Graves Survey, Serrill Thornton was born September 11, 1806 and died January 23, 1894. He served in Co. E, 118th N.Y. Infantry and was a member of the G.A.R. Searching for SERRILL THORNTON in Sioux County Iowa?